Dual-force cutting: The two blades spin in unison cutting grass into a fine mulch. Great for mulching or bagging (comes standard with a large capacity grass bag). Personal pace with traction assist: As with many Toro mower, the TimeMaster features the smooth and responsive Personal Pace self-propelled system. As you walk, the TimeMaster will be propelled. Walk slow, and the self-propel will engage lightly. If you want to walk fast, the self-propel will hop along as quick as 4.5 mph. Quick stow lever: When finished, the TimeMaster handle will fold up with a single flip. No bolts to loosen and loose! Despite the size of this unit, you will find that it stores quite well. Spin-stop blade stop: When emptying the bag, stopping to clear debris or any other reason, the blade will stop and the engine will continue to run thanks to spin-stop! This innovative feature from Toro is super convenient and prevents the need to restart the engine repeatedly when mowing. 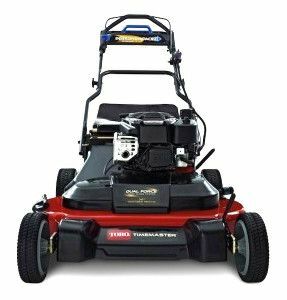 Powerful 8.75 hp OHV engine: This Toro-made engine is specific to the TimeMaster and features lots and lots of pep. The OHV design makes it great for hilly terrain as well. 3 year warranty: Comes with a 3 year full coverage warranty as well as a 3 year guaranteed to start promise from Toro. If you have any problems, remember that our small engine repair shop is always here to help you with your Toro equipment. For a visual introduction to the Toro TimeMaster 30″ wide walk-behind mower, please take a look at the video below. It shows many of these features in action! Introducing the new Toro Timemaster 30" wide area mower built for homeowners. Friendly features, ease to use and unbelievable maneuverability. Save up to 40% of your mowing time compared to a standard 21" mower.